Keep Indianapolis Beautiful (KIB) is a non-profit dedicated to creating vibrant public spaces and healthy natural landscapes in Indianapolis through volunteer-driven community improvement projects. The KIB headquarters site, built in the early 20th century, had until recently been a brownfield and an abandoned warehouse. In 2014, Omni provided a solution that bridged the building’s structural limitations with the ecological aspirations of KIB. At an average depth of 3” and weight of 15 pounds per square foot, the green roof was established with only modest structural modifications. In spite of the light weight, the design created a life support system for a Midwestern prairie rich in biodiversity. More than 85% of the 14,400 square-foot vegetative roof is comprised of native Indiana prairie flowers, ecologically integrating the building with its surroundings. The system includes high-efficiency micro-spray irrigation. In 2014, the Omni Green Roof filtered approximately 360,000 gallons of rainwater and retained a large portion of this within the system. 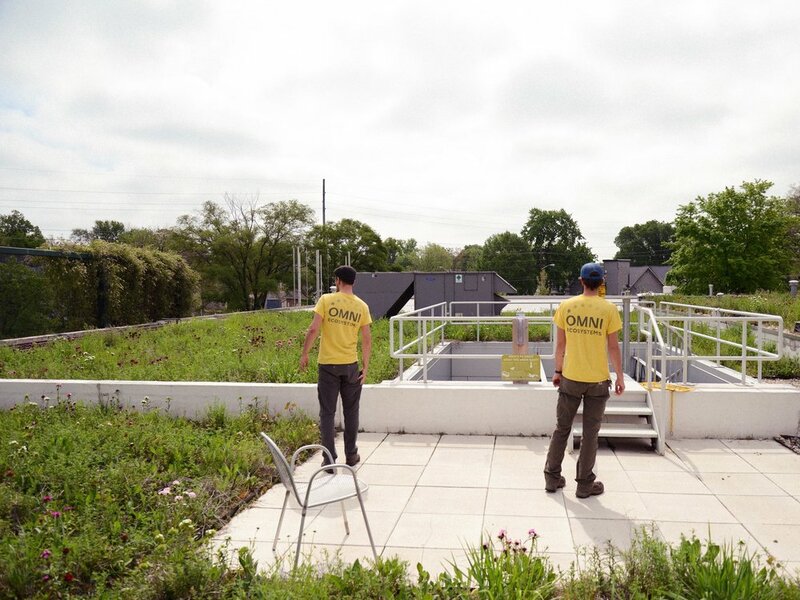 The KIB green roof is home to an advanced energy study to assess the impact of the Omni Green Roof to the building’s energy usage in comparison to a standard extensive sedum green roof and a white roof membrane. The green roof was the only change to the building envelope in 2014 since energy records started in 2011. While data collection will continue, preliminary data suggests that the meadow green roof lowers surface temperatures to a level that is statistically insignificant in comparison to air temperature.